The membranous shared wall between the trachea and esophagus. The tracheoesophageal party wall is also known as the membranous trachea. This membranous wall makes up one-third of the trachea’s circumference; the other two-thirds is bolstered and stiffened by cartilaginous rings. These stiff cartilaginous rings help to keep the trachea open, whereas the membranous wall has some flexibility and may momentarily bulge into and narrow the tracheal passageway, as during a cough or a Valsalva maneuver. Patient with SNC who is treated for presumed infection because of her congested rumbling “productive-sounding” cough. The "X" marks the same place in this photo and the following photo. Patient is at the moment of a deep, productive-sounding cough, but in fact it is not productive. Her many courses of antibiotics are probably unnecessary. 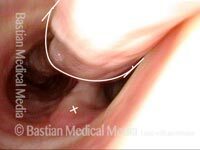 The narrowing of the lumen is due to inward bulging of the membranous tracheal wall. The blur is caused by vibration during this cough. Normal laryngeal entrance, with vocal cords in abducted (breathing) position. 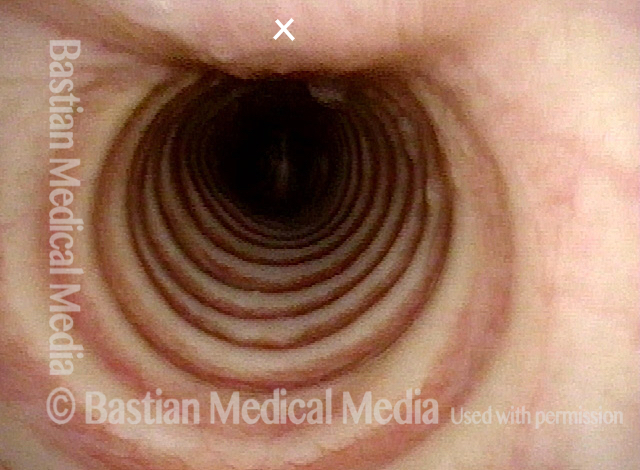 View in normal mid-trachea. Note that the cartilaginous rings make up approximately 2/3 of the circumference and that the membranous trachea (upper photo at 'X') is more flat. View just above the carina, where the distal trachea splits into left and right mainstem bronchi. Anterior take-off of carina at the 'X'. 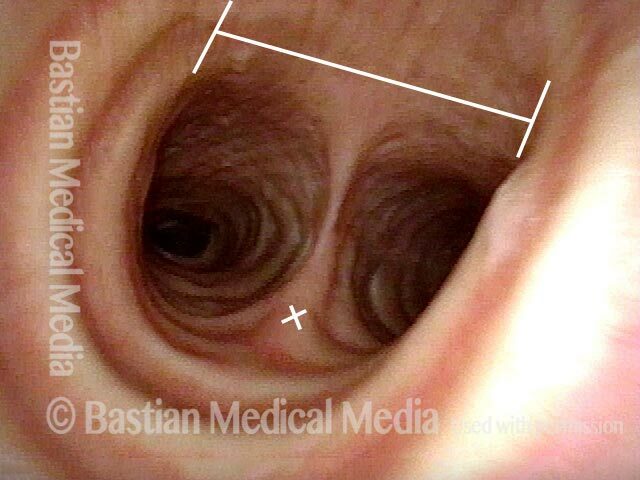 The straight line delimits the membranous (flexible) tracheal wall. With Valsalva maneuver to accentuate patient’s functional expiratory wheezing. Note that the membranous tracheal and bronchial walls bulge inward on a functional basis to narrow the airway. Wheezing begins to be heard. The 'X' again marks the anterior take-off of the carina. Compare with Photo 3. 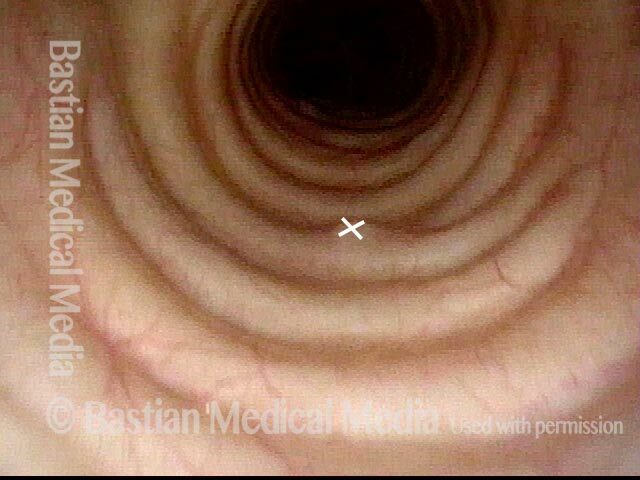 As bulging inward continues, the left mainstem bronchus is particularly blocked. This explains why, on auscultation of the chest, wheezing sounds louder on the left than the right. Compare with photos 3 and 4.